Westward Bound Longhorns at Dallas Pioneer Plaza Cattle Drive Owner of Venue: City of Dallas Office of Cultural Affairs Public Art Collection A roll in to Pioneer Plaza with your photographic equipment can leave you with months worth of work. I find myself going back to the numerous folders I have shot throughout the years and find a new western gem each time! If you want to keep your eyes on Texas, this is the place to explore! 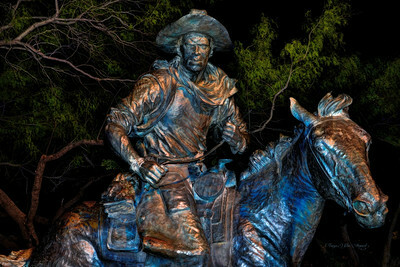 Boasting as the 2nd most visited landmark in Downtown Dallas (the first is Dealey Plaza) it howls softly stories of the rugged Cowboy driving their Longhorns and herds to the markets of Missouri along the Shawnee Trail. When I photograph scenery, I like to climb upon, crawl under and zoom in for unique compositions. 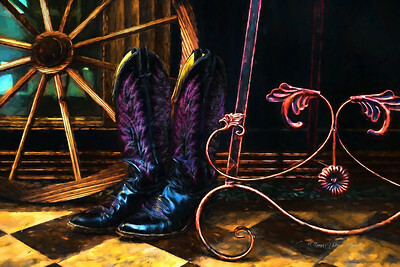 I love this close-up of the boots and stirrups and decided to present a colorful painting as well as an HDR version of my original photo! Digitally Painted from my original photo! Westward Bound Longhorns at Dallas Pioneer Plaza Cattle Drive Owner of Venue: City of Dallas Office of Cultural Affairs Public Art Collection A roll in to Pioneer Plaza with your photographic equipment can leave you with months worth of work. I find myself going back to the numerous folders I have shot throughout the years and find a new western gem each time! If you want to keep your eyes on Texas, this is the place to explore! 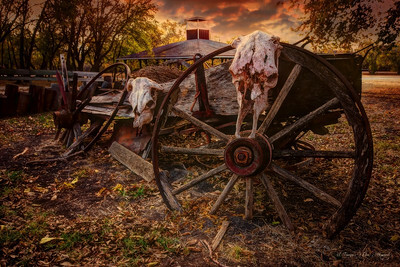 Boasting as the 2nd most visited landmark in Downtown Dallas (the first is Dealey Plaza) it howls softly stories of the rugged Cowboy driving their Longhorns and herds to the markets of Missouri along the Shawnee Trail. When I photograph scenery, I like to climb upon, crawl under and zoom in for unique compositions. 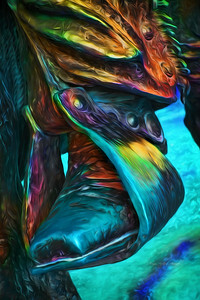 I love this close-up of the boots and stirrups and decided to present a colorful painting as well as an HDR version of my original photo! HDR Processed from my original photo! Cowboys at Preston Ridge Shopping Center Frisco, Texas Frisco, Texas is home to over 150 open-air bronze sculptures and statues spread out across the city’s parks, shopping center passages and gardens. Some are quite visible from a drive-by and some you have to happen upon or discover within the parks. Preston Trails stretched from Dallas; south to north in the old pioneer days, changing to Old Preston Road and now simply called Preston Road. Created by the Republic of Texas in 1841 along the Red River it had been used for centuries. Today, one of our more smaller highways and well-traveled is now Texas State Highway 289 which follows near the former road. Preston Ridge Shopping Center in Frisco is home to a cowboy scene with a small pond hosting a lone longhorn taking a sip of refreshing water. 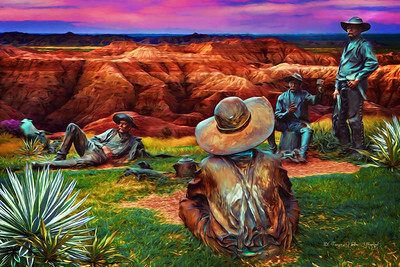 While the cowboys comfortably camp and drink their all-fired Arbuckle”s you can’t help to wonder what their conversation must be. I took the scene an edited out the cars, shops and modern city-life to prepare something more western amplified to give them a more true drover and cowpoke appeal! Udderly Yummy! 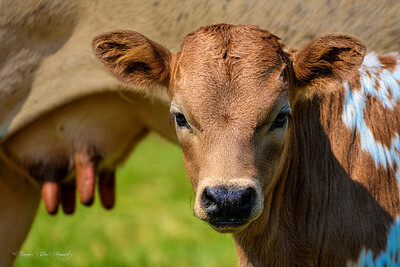 Baby Longhorn with udders, Plano Texas We have a field of longhorns that belong to our Company where several newborns have captured my heart; I spend hours watching them grow and play. This one was near the fence and allowed me to sit closely while he was in the middle of his lunch. His horns have not started to sprout out yet, but I did see them the other day when I sat out once again during my lunch time! 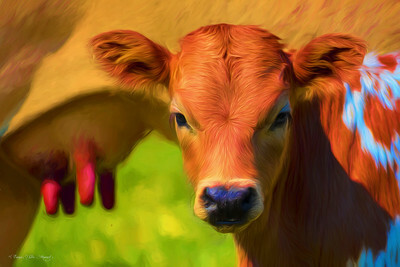 Baby Longhorn with udders, Plano Texas Here is my original photo. Granbury, Texas I’ve watched this Art Cabin being built from ground up over the course of a few years. My Brother created a wonderful arts and crafts log cabin for my Sister-In-Law where she can spend hours painting, reading her Bible or decorating guitars and other items. I took this photo on the day we buried my little To-To for which I cherished every moment of her 19 years with me. 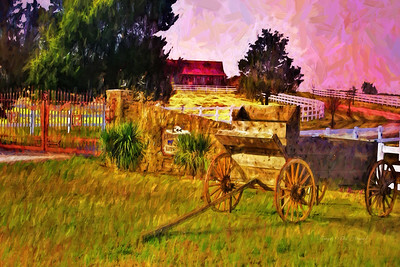 Since my Brother let me bury To-To out on his little ranch, I thought I would convert my original photo into a painterly and wintry scene to give to him as a Thank You gift! Painted Effect from my Original Photo! These are my Pap-Paw's Cowboy Boots that he wore while cowboying on the 6666 Ranch in Guthrie, Texas. I have been honored to be able to set up a Window Art Installation at 1900 Elm Street in Dallas, Texas! Thought I'd take a quick pic of the boots and create a digital painting from it! Original photography by me! Enjoy! Bluebonnets ~ State Flower of Texas Ennis Bluebonnet Trails Snapping around 356 pictures on this gorgeous April 4th, 2017 sunny clear day, it was hard to resist moments stomping around within the fields filled with the famous Bluebonnets of Texas! The fields are alive with blue and purple hues during late March and most of April each year. While daily changes occur from pastures to meadows the coverage can be sprinkled, widespread or utterly populated so far as your eyes can see. It’s a photographer’s and painters haven! 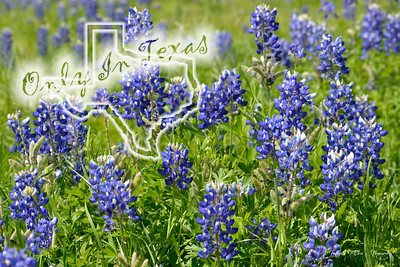 Proof why we love bluebonnets: There are songs and poems written about these appetizing wildflowers, Indian lore called the flower a gift from the Great Spirit, there are popular festivals and fair events celebrating the blossom, families and couples spend hours finding the right roadside spot to create memoirs through their cameras, pet lovers sprawl inches away from their furry critters to take their photos, gift shops and boutiques adorn their outlet with garments and souvenirs for us to lavish and show off and finally, of course, it just makes for a beautiful scenic drive no matter where you are in Texas! And thanks to Lady Bird Johnson, these lush and ornate blossoms are abundant along the highways and byways of Texas! Oh and one more thing.. Did you know bluebonets are part of the pea family? But beware, they can be quite toxic to humans. Original photo by me! Pioneer Plaza Cattle Drive ~ Downtown Dallas Longhorn Every angle of a Longhorn demands attention! Right? Each bronze statue is created by Robert Summers of Glen Rose, Texas and believed to be the largest of their kind in the world. I have watched them add more; one by one for many years! They gallop down the bluff, they slip and slide along the trail and pause for a lap of water before crossing the stream! They are amazing! Painted Effect from my Original Photo! Steel Rear Pioneer Plaza Cattle Drive ~ Downtown Dallas Every angle of a Longhorn demands attention! Right? 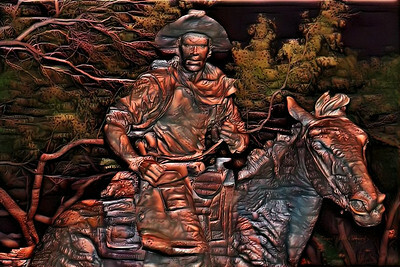 Each bronze statue is created by Robert Summers of Glen Rose, Texas and believed to be the largest of their kind in the world. I have watched them add more; one by one for many years! They gallop down the bluff, they slip and slide along the trail and pause for a lap of water before crossing the stream! They are amazing! HDR Photo Process from my original photo! 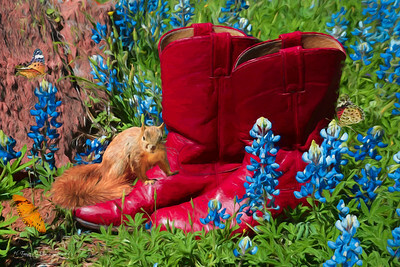 Inks Lake Texas Hill Country' Austin, Texas Area Mother's Red Boots Took a little trip through the Texas Hill Country for the Texas Bluebonnet season yet again! Found friendly critters and set my Mother's Red Cowboy Boots out! 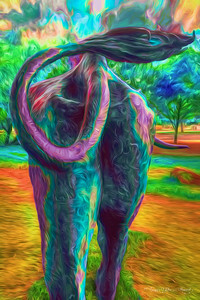 Enjoy my painted effect from my original photo! Faded Glory Granbury, Texas I took this picture near the Downtown Square....well, I took a lot of pictures in and around Granbury! Granbury is one of the most historic cities in Texas where you won't want to miss their many Festivals, historic museums, enticing parks, wineries, trolley tours, the Granbury Lake and so much more! The town has loads of preserved vintage and prairie style homes & buildings worthy of spending a day taking photographs. 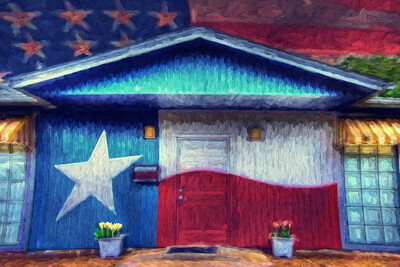 Its not often you see our Texas Flag painted onto a house. This shop was up for rent and I hope they didn't paint over the flag! Digitally Painted from my original photograph! Redish Ranch Highway 82 ~ Whitesboro, Texas As some of you know, I designed jewelry for years and many times took "day trips" with my Mom; taking a packed lunch and camera of course, to sell to my Boutiques in the rural towns surrounding Dallas. This is one of our stops as we both sat and enjoyed our sips, subs and sunset! I miss you, Mom! 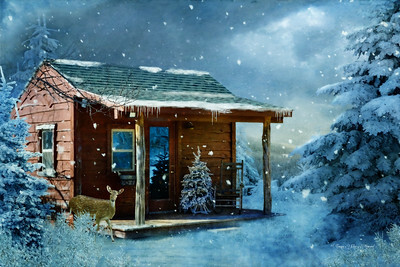 Digitally Painted from my original photograph! Standoff Plano, Texas ~ October 2016 In the midst of hustle-bustle traffic flowing around the Legacy area of Plano, reminders of it's farmstead heritage are sprinkled about with fields of bison, longhorns a few miles away you will even find llamas! While the city is in a huge growth spurt, incredible forms of architecture for local business shopping and dining districts are popping up which entice the population to make Plano it's home. I drive by pastures fenced in parallel to major corporate offices where the Longhorns graze and spend their days entertaining the passerbyers (yes, this word is in the Urban Dictionary) and hardly ever get the chance to stop. Many times that I did pull over, the herds were way off next to the urban stone buildings or too deep in the trees to take their pictures. I can't tell you how many times I pass by where they are right along the fence line and I don't have my camera! Uggh! I decided to pack up my camera gear the other day and take my chance for a photo opp and found it! Majestic and proud they stood at a perfect distance with no human race relics distracting my lens. To my surprise they even moved closer to me, watching me and allowed me to record their existence forever! I was in ranch heaven! To add a little humor to my event, as I was snapping away I noticed a huge figure stampeding toward my right from the field. This guy was serious and rammed the metal fence just next to me, stood back a tad and dug his hoof into the dirt several times as if to charge at me again....along with loud snorting! Of course, I stepped back and wondered how strong the fence was and gave him my acknowledgement with respect. This went on for about 20 minutes, yet I stood my ground and "whispered" to him: "Hey there, fellow! I'm just here taking your picture. Thank you for letting me take your picture!" Each time I took a side step, so did he. If I moved down the fence line, he did too all the while snorting, digging up dirt with his hoof, raising his head up and down quickly and watching to see what I would do next. He must have some history at the rodeo. I dared NOT to say Ole'! for fear he would conquer that fence! And let me add, he would not allow me to get near the fence any more to continue taking photos, so I finally made a little peace with him and continued to stand on my tip-toes to finish my goal of the hour. Did I enjoy my experience with a laugh to my heart? Why yes! That was a fun experience for me! I nick-named him Dillinger while his eyes escorted me all the way back across the street to my SUV! Digitally painted from my original photo! Cowboy Medicine Dallas Pioneer Plaza Cattle Drive Downtown Dallas What makes a rancher happy? His work. 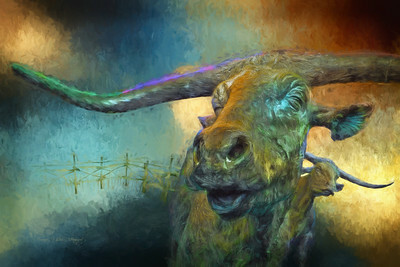 In the earlier years of the Shawnee Trail where cowboys sauntered the prairies from the Trinity River to Missouri for market and trade, they surely were merry with their lively livestock; especially the mighty longhorn. 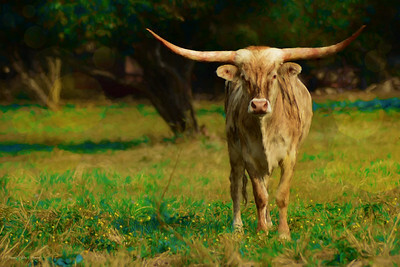 And in turn, the longhorns evidently enjoyed their trails while roaming the bluffs and grassy fields along the way. Each moment I viewed my photograph of these cheerful looking longhorns taken at Pioneer Plaza Cattle Drive, I couldn’t help but float the thoughts of “laughter is the best medicine”! Most all of the bronzed herd are detailed with more serious stern features, while this bull appears to be smiling! Hence: Cowboys Medicine! Digitally Painted from my original photo! 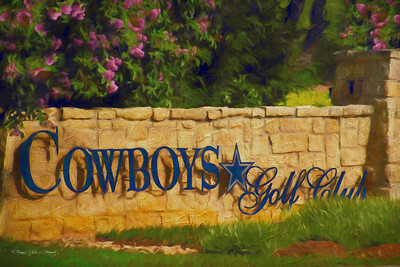 Dallas Cowboys Golf Club Grapevine, Texas Digitally Painted from My Original Photo! 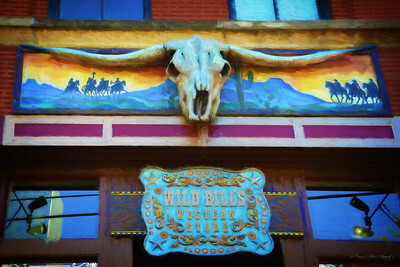 Wild Bill's Western Store 311 N. Market St. Dallas, TX 75202 Downtown Dallas I am wild about Bill’s! This is a must do, must shop and must see western store in Downtown Dallas. Located in the West End Historic District, you can’t miss it. It’s surely a rarity that a family owned business has created such a long lasting impact of success for over 50 years! Boots! Buckles! Hats! Jewelry and so much more that you’ll be drooling for Bar-B-Q. And if you’ve never sat in a saddle, you will find yourself hopping on the ones he has line up at his western vintage bar….where you can sit and point and pay! Digitally Painted from my Original Photo! Storybook Ranch McKinney, Texas I had the pleasure of spending Thanksgiving with a Special Needs group "Believe & Achieve" along with the owners and employees of Storybook Ranch in November of 2012. We had a Texas style Thanksgiving Dinner, went for trail rides on their horses, spent time petting the animals and a grand finale in one of their great hall rooms for music and dancing. This is a venue well worth taking your family to fora huge Pumpkin Patch in the Fall, superb place for western weddings or any other type of family gathering! My favorite part of Storybook Ranch is their Western Town where original and restored frontier and pioneer buildings make up the scene for a movie! My Original Photo! 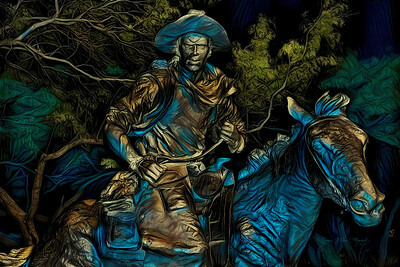 Gitty Up (C) Cowboy Statue, Dallas Pioneer Plaza Cattle Drive ~ Downtown Dallas, Texas Falling in love with this bronze statue, I decided to create not only a HDR photograph, but to compose a couple of digital painting effects, too. This one is my favorite! Digitally painted from my original photo! Gitty Up Dallas Pioneer Plaza Cattle Drive Downtown Dallas Once printed, this appears to be a copper metal embossed plate! Digitally Painted from my original photo! Gitty Up Dallas Pioneer Plaza Cattle Drive Downtown Dallas This is my original photo complete with an HDR photo processing. I also did 2 special effects that you will find within this folder, too! HDR Photo Processed from my original photo! Snapping around 356 pictures on this gorgeous April 4th, 2017 sunny clear day, it was hard to resist moments stomping around within the fields filled with the famous Bluebonnets of Texas! The fields are alive with blue and purple hues during late March and most of April each year. While daily changes occur from pastures to meadows the coverage can be sprinkled, widespread or utterly populated so far as your eyes can see. It’s a photographer’s and painters haven! And thanks to Lady Bird Johnson, these lush and ornate blossoms are abundant along the highways and byways of Texas! Did you know bluebonets are part of the pea family? But beware, they can be quite toxic to humans.